Well made and well designed, give your pet friend a good challenge while eating all dogs eat too rapidly, which unfortunately can cause bloat, discomfort, and other digestive problems. 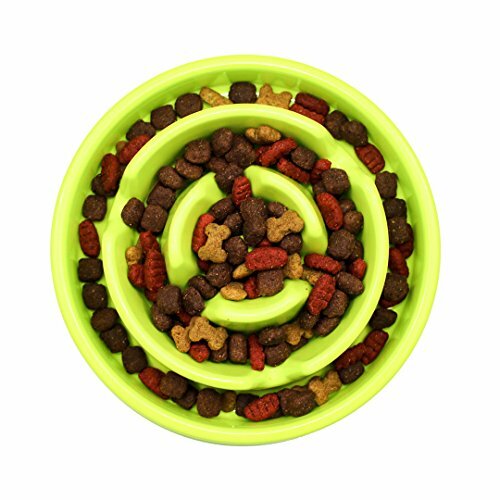 This bowl will help to restore your dogs natural eating habits so that meal times become fun, healthy. The bowl promotes healthy slow eating, helping prevent obesity, bloat, regurgitation and overeating. This pet slow bowl is strong and durable, top rack dishwasher safe, and really great for all kinds of dogs, slow or fast eaters. ✔️VETERINARIAN RECOMMENDED: Vets recommend Healthy Feeder Slow-Feeding Dog Bowl to aid in digestion and help prevent bloat. ✔️STOPS OVER EATING, CHOKING, EATING TOO FAST & OBESITY: Dogs especially eat very fast. They can overeat and choke on their food. This bowl helps them slow down for a healthier experience. ✔️PROMOTES HAPPY HEALTHY EATING: Healthy Feeder Slow-Feeding Dog Bowl help dogs eat up to 10X slower improve digestion. ✔️MAKE EVERY MEAL FUN AND CHALLENGING: Interactive Slow Feeder Bowls allow your pets meal times to be much more as nature intended and stop feed times becoming boring. ✔️WARRANTY: 100% Satisfaction Guarantee If your item hasn't arrived or isn't as described all products purchased from our company are guaranteed to keep in good repair for 90 days. If you have any questions about this product by PatPaw, contact us by completing and submitting the form below. If you are looking for a specif part number, please include it with your message.